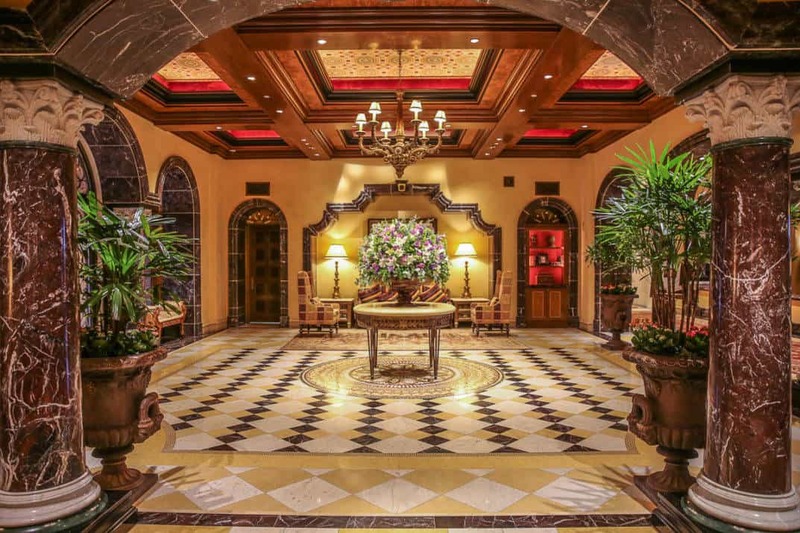 The Fairmont Grand Del Mar, north of San Diego, is an Italian inspired oasis that transports your family to a Tuscan estate. The exterior of the Fairmont Grand Del Mar takes cues from Addison Mizner’s Italian influenced creations in Palm Beach and Boca Raton. Fans of The Breakers will feel right at home in this Golden State version of a five-star family resort. When everyone is concerned about mosquitoes and Zika virus, I was happy to see all flying objects at the Grand Del Mar turn out to be hummingbirds. Hummingbirds are everywhere at the Grand Del Mar. Even though the Grand Del Mar was built in 2007, the interior public spaces evoke the residential flow of a Gilded Age residence. Although deceptively expansive, the property feels intimate and expands down on a slope so guest room floors are below the main level. We never learned how to find our room without the use of signs with all of the twists and turns of its corridors, but that hardly distracted us from the pleasure of returning to such a beautiful suite or discovering all of the different alcoves of the property. Families will find suite accommodations spacious, formal, and tassled. Of course a real Tuscan estate would look very different on the inside. It is more apt to describe the style with an abundance of shiny black marble as an Italian residence modeled after the Venetian or Palazzo hotels in Las Vegas. The pool area is memorable. There are two in addition to the most inviting kiddie pool you’ve ever seen, and several hot tubs located throughout and spectacular views of the golf course and neighboring hills. Spa guests and adults have a separate pool off of the fitness center for quiet sunbathing. Pool service was excellent in August, and the staff worked very well to provide five-star service despite large crowds. The jockey red cushions, awnings, and umbrellas at the pool areas playing off of the ceramic pink terra-cotta tones of the buildings delivered postcard perfect scenery. It inspired me to order a red drink just to partake in the surroundings, and the strawberry mint refresher was, indeed, grand. When I return I will absolutely purchase a vintage-style red halter one piece, black cat-eye sunglasses, and have my toes painted red to go with this theme. Even the polish of the large kiddie pool will feel like a true, family vacation for those still weighted down by soggy swim diapers and for those who have to change them. The world’s most glamorous kiddie pool. The signature poolside drink is a strawberry mint refresher. Guests can arrange beach service with the concierge, and the hotel escorts your family to the Del Mar beach in the resort car, sets up chairs and umbrellas, provides beach toys, and arranges a pick up time to collect you. The resort restaurant, Amaya, offers breakfast, lunch, and dinner next to the pool. Most families will eat their meals there and poolside or grab fast items at the Cennt’Anni Café, which serves breakfast sandwiches, pastries, fresh pressed juices, gelatos, and sinful viennoiserie items. Early rising East Coasters can reward themselves with warm chocolate croissants fresh from the oven made by a Paris-trained baker. In-room dining was an elegant experience given that our suite offered a dining table. Amaya serves breakfast, lunch, and dinner. Our children had such an incredible time at the Grand Del Mar kids’ club called the Explorers’ Club that they begged to return at night. My husband and I decided to experience a very adult meal at Addison without the kids, the highlight of our stay. 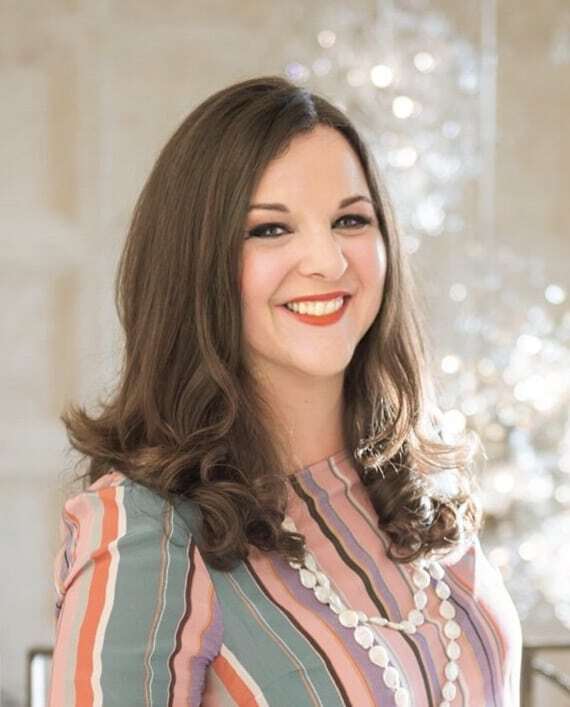 Addison overlooks the Fairmont Grand Del Mar golf course and is a short drive in the resort BMW to enjoy a key culinary destination, the only Relais & Châteaux restaurant in Southern California and the only one to have received the AAA Five Diamond Award and Forbes Five-star award. Chef William Bradley focuses on an ingredient’s core flavors, showcasing everything at its best, making an extraordinary tasting menu where each plate will likely be the best duck or king crab you will have ever tasted. Honestly, I don’t think that we’ve had a meal like this since our last trip to Paris at L’Astrance, one of my all-time favorites. Sous Chef Stefani De Palma of Addison served us one of our favorite meals. Our eleven-course tasting menu had been customized to accommodate my husband’s gluten allergy. The gold dusted potato-flour popover balls were flawlessly made as comfort food for the gods, and my husband and I could each have eaten ten or twelve had no one been watching. The Grand Del Mar has my kids’ favorite style of resort kids’ club. They offer a more customized experience for children and allow siblings of different ages to remain together if that’s what makes them more comfortable. It’s really hard on families when resorts insist on separating children by ages. The counselors plan activities based on the feedback of the children. The kids’ club area is difficult to find so start your adventure treating it like a treasure hunt and give your oldest child a resort map to lead the way. The space is massive with games crafts, screens, and closets stacked to the ceiling with toys and props for any possible activity. I asked if my children could be outdoors that morning in case they ended up returning to the kids club that night, and their counselor grabbed equipment to create an elaborate obstacle course for them to race against their own best time. In addition to the Explorer’s Club, the Fairmont Grand Del Mar offers additional family programming; we enjoyed a regular appearance of a local critter specialist. And these critters definitely didn’t disappoint and weren’t your garden-variety birthday party critters. A brave brother and sister, with eyes closed, had a large snake placed in their hands. 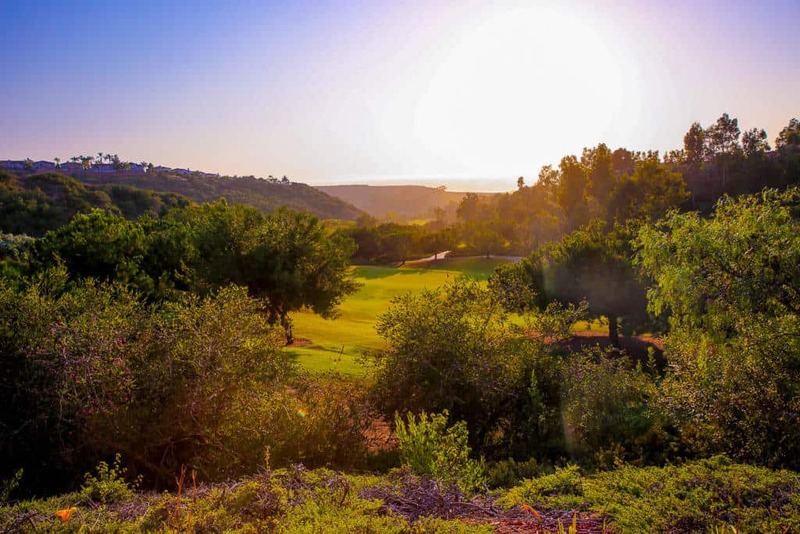 The Fairmont Grand Del Mar also has an active tennis and golf program for children to sign up for pro lessons, bicycles to borrow, and an equestrian center that they could ride, observe, or groom the horses. Changing of the guard in the lobby. The Fairmont Grand Del Mar takes wellness very seriously, with an exceptional five-star spa, cleverly decorated with framed Hermès scarves in all of the public areas, wet areas, and locker rooms. The fitness center also offers daily classes that usually end up outside in good weather (almost all of the time). If you don’t live in Southern California, simply sitting in the outside areas of the spa will feel like a massage because of the incredibly temperate climate and the lush surroundings. I chose the signature experience called Renaissance, described as having a similar experience of being in the womb. I was very curious to know what it feels like to bounce around in amniotic fluid. I started on a platform and received a nourishing marine mud wrap before being cocooned in towels. The platform descended into a dense water-bed-like mattress until it dropped low enough that I was floating, feeling the water-bed on all three sides without the experience of gravity while my skin absorbed the nutrients of the marine mud. I found that my mental rhythms slowed down after the fascination of the sensation. I rinced in the Vichy shower to remove the mud from my body in privacy and then returned to a traditonal massage table for a full body massage. I would absolutely recommend this treatment instead of jumping to a Swedish 60 or 80-minute massage because I think that I provided additional meditative benefits that any parent could always use. The Fairmont Grand Del Mar Spa is adorned with numerous framed Hermès scarves. The massage table, Vichy shower, and waterbed for the Renaissance Spa treatment. 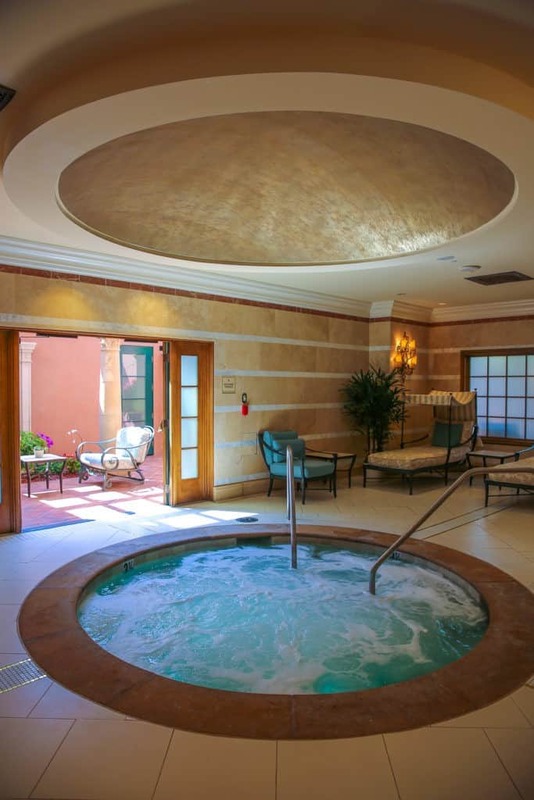 I did learn that the Fairmont Grand Del Mar spa practitioners have a specialty with lymphatic drainage, and my massage therapist has received extensive education on this type of modality which makes me want to try that on my next visit. The spa pool at the Farimont Grand Del Mar. The Fairmont Grand Del Mar boasts a porte-cochère area worthy of the opening credits to 1980’s classic Dynasty. If you don’t arrive in a luxury car worthy of the crowd, you’re in luck. The resort has hosted the Porsche driving experience for the last few summers and offers a chance for guests to drive their line of e-hybrid models. I chose the Cayenne S Hybrid and took it for a spin to nearby La Jolla and on the California freeways. The Fairmont Grand Del Mar hosts the Porsche Driving Experience every summer for guests to test drive the Porsche line for an afternoon. 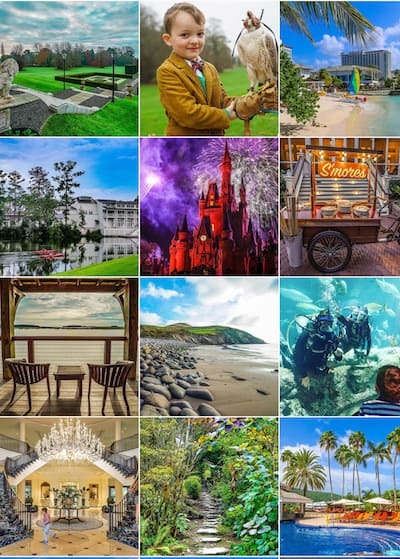 Overall, the Fairmont Grand Del Mar was a full-amenity resort able to create the feeling of a private estate that simply entertains on a grand scale. Given that the San Diego Zoo and Legoland are each a half-hour in either direction there is enough to keep a family happy for a week. Like the Cloister at Sea Island, the resort has an incredible chapel for weddings that I imagine is a hot property that books far, far in advance. Now having been home a few weeks from the Fairmont Grand Del Mar (check dates & rates with TripAdvisor), I just keep thinking of a walk we took circling the property at sunset. Serene terra-cottas, red cushions with white piping, sun-drenched landscapes of purple and green, and the taste of warm chocolate croissants— in other words, memories of paradise. Although we were guests of the Fairmont Grand Del Mar, these opinions are completely my own. This luxe hotel looks to-die-for fabulous! Love all of the amazing activities for kids and adults to enjoy. Hubby would definitely love the Porsche driving opportunity. And the food looks incredible! The food was truly spectacular, but I loved how family-friendly it still felt while being formal. We stayed there last Spring and it was fantastic! Yes, it is a wonderful resort!